With any Web content management system, you’ve got to budget for continued support, training and improvements. After more than ten years’ experience setting up sites, and moving content between straight HTML, to writing my own customized content management system, to migrating to custom enterprise systems, including proprietary systems, and now to Drupal, I’ve found that the smart money in Web content management goes to systems that are open source, and broadly supported by the community. We used to suffer from being “locked-in” to proprietary systems, and our vendor would milk us for all they could, or nickle and dime us to death… but now, since Drupal’s software and security improvements are free for anyone to download, all we pay for is great service. That’s what Drupal vendors compete on; they can’t lock you in. Proprietary Web content management systems are basically fighting for their lives right now, and are working hard to find a niche where they can survive — so they’ll say anything to get you stuck to their product. This is called “vendor lock-in.” Once you’re in those systems, how do you escape? Your choices are limited, since the number of “partners” is likely nowhere near as big as the number of shops supporting Drupal now, and in the years to come. How big is your proprietary system’s development team? Drupal 7 Core had nearly 1000 contributors, and the number of folks working on Drupal contributed modules is now up above 23,000. By the way, almost 6000 modules are available for Drupal 7, the most current version. Drupal is widely supported by a huge, vibrant community and is currently installed on over a million Web sites (see http://www.drupalshowcase.com/ for some examples). Wow. So… some mannequins spy on you. In the lead-up to the holiday shopping season, BusinessWeek reported that “bionic mannequins are spying on shoppers to boost luxury sales” at five unnamed companies. The $5,130 EyeSee mannequins from Almax have cameras embedded in their eyes that use IBM Cognos software to record the number of shoppers checking out window displays and clothes, while also noting their age, gender and race. They don’t keep any images of the customers, just the aggregate data about who’s been considering blowing money on cashmere sweaters and $300 jeans. But it may not stop there. “To give the EyeSee ears as well as eyes, Almax is testing technology that recognizes words to allow retailers to eavesdrop on what shoppers say about the mannequin’s attire,” reports BusinessWeek. This is the second time I’ve heard a business float the idea of recording customers’ conversation in order to better advertise to them. The desire for better marketing may just be the biggest threat out there to your privacy. Constant multi-tasking makes us worse at everything — including multi-tasking. 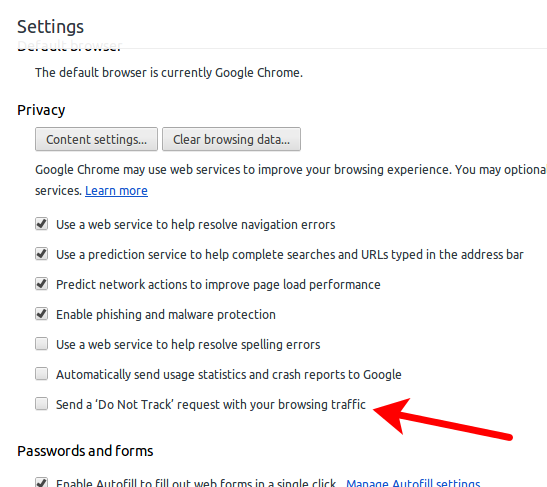 Shows the “Do Not Track” option in Google Chrome v.23 and up.